Maybe people have winter blues. Maybe people are just downright sick of all the bad economic news we've had to endure for years now. Whatever the reason, people seem to be hungry for happiness. This past month, we noticed a trend of articles on happiness and its many positive effects on our lives and our work. According to the demonstrably happy Shawn Anchor, psychologist, author of The Happiness Advantage and founder of Good Think Inc., happiness can have tremendous positive benefits on our personal successes, as well as company-wide successes. He proposes, "it's not necessarily reality that shapes us, but the lens through which your brain views the world that shapes your reality." Therefore changing the lens can change not only happiness, but change business outcomes too. In his research, Anchor has found that most companies follow this formula for success: "If I work harder, I'll be more successful. If I'm more successful, then I'll be happier." But this is backwards thinking, he argues with research to back him up, because every time our brains process a success, we change the goal posts of what we deem a success. This means we never truly get to success, or happiness. Fortunately, his research has shown that our brains appear to work in the opposite order. If we get happy first (meaning not make happiness a condition of or reward for success), we give ourselves the "happiness advantage." This means when our brain is positive, it performs better than when it's neutral or stressed. Intelligence, creativity, productivity and energy levels all rise when our brain is positive. By extension, happiness should bring success. According to Anchor, the goal is finding a way to feel positive in the present. Fortunately he believes this can be done with just a little work. His research found that simply by writing down three things we feel grateful for every day for 21 days, we can effectively re-wire our brains to give it the happiness advantage. It begs the question: Is happiness a mere habit? Charles Duhigg, author of a new book called The Power of Habit, describes a habit as a choice we made at one point, stopped making, but continued doing. Can we just choose happiness for a few weeks and make it habitual? According to Duhigg, changing any habit however we want is as simple as identifying the habit, then its cues and rewards - and in doing so, we change our brains. If our happiness can change our performance at work, our leadership, our bottom line, and on and on...reaching for a habit of happiness seems well worth it. Please see the dedicated section below on happiness for more. When the Enron Ponzi scheme collapsed, banks came in to save the gas and power industries. When the Wall Street Ponzi scheme collapsed, governments came in to save the financial services industry. Now who is going to save us when the government Ponzi scheme collapses? We won't know until we know what results from all this government fiscal (annual trillion dollar deficits) and monetary (massive money printing) intervention, but for now let's make hay while the sun is shining because those economic storm clouds are still visible off in the distance. But thank goodness governments have averted disaster, and for the time being all seems to be functioning a little bit better. Of course no one in Greece or Southern Europe, where official unemployment is above 20%, would agree. But we deal with what's directly in front of us in our personal worlds. So for the time being, the United States is looking like the prettiest puppy in the ugly economic dog show. It can't be said too many times...Thank God for the energy industry! The unconventional shale resource plays are driving billions of dollars of investment and expenditures in the United States. Literal gold rush style booms are happening in Pennsylvania, North Dakota and South Texas. And smaller but still measurable booms are occurring in several other resource rich geographies. A ton of those billions chasing unconventional oil & gas is flowing through Houston, and as money goes, so go jobs and prosperity. Just a couple days ago, TransCanada announced they were proceeding with the Oklahoma to Texas Gulf Coast section of the Keystone pipeline, a tidy $2B+ investment over the next couple of years. Construction companies, material suppliers and lots of engineers and blue-collar workers are going to benefit from this, as well as many other investments supporting the current energy boom. It reminds me of a 1980s bumper sticker seen around Houston, "Please God, give us one more oil boom. We promise not to piss it away next time." Well, we in Houston have gotten our wish, so let's just see how we handle this right place, right time situation. Nothing in the world works without energy and nothing in the world is produced without natural resources, so no matter what Washington bureaucrats and carbon hysterics want to believe, America's economy is going back to the basics, back to what first gave America the ability to be the land of opportunity - natural resources. Can a refocus on natural resources and production turn America's economy around? Can it keep us from a government Ponzi scheme implosion? Only time will tell. But for now, let's take advantage of our day in the sun and remember this time that storing a few, or maybe a lot of acorns for the winter might be wiser than partying like it's 1999. The decline in the financial service industry's influence became even more apparent this bonus season. With Morgan Stanley announcing maximum cash bonuses of $125,000, and with deferred compensation being significantly equity-linked, the bloom for many investment bankers seems set to fall from the rose. The number of senior bankers wanting to leave Wall Street may be far greater than in an average year, but where will they go? Jobs outside of Wall Street that can make use of banker skills are not likely expanding at the same rate as bankers looking for those jobs. Welcome to the new normal. This really shouldn't be such a great surprise if people realized that average pay in the United States has not budged in at least ten years. As an example, an agreement in GM's bailout was that new union hires would come in at significantly lower wages. The great easy money grab in most every profession, even banking, and quite possibly private equity and hedge funds too, may mostly be in our rear view. That doesn't mean there won't be bankers and investors getting rich anymore, just that it will become more the exception than the rule. Demand in the hiring market is growing for cashiers, waiters and health service providers, but that's not our market, nor is it a sign of a healthy, productive economy. For the American economy to get itself better structured, more and more companies and people need to start making more and more stuff, rather than just pushing paper and punching keyboards. As I told one banker a few days ago, wealth accumulation is probably moving from something you could do in a few years to something that may now take an entire professional career. Oh the horror! Following our current energy boom should be a new boom in making stuff because once you have more natural resources lying around, you seem to find more things to do with them. The making stuff world should begin to see job growth. Look for careers with companies that make stuff, or go out and start a company with your friends and make stuff. Now's a great time to become a real entrepreneur who can become a 20-year overnight success story. Producing goods is the foundation to all economies, so it's time we got back to doing more of that. What you own today matters much less than what you earn tomorrow. Speaking of stuff...and happiness...we often hear that many rich people are unhappy. Why might that be? Maybe it's because they own a lot of stuff. "Wouldn't it be cool to have the highest priced Mercedes and a yacht and homes in Aspen and Paris?" Sure it would be cool, but the more stuff you have, the more you have to maintain. And the more precious your stuff is, the more pain you feel if it gets damaged. Maintenance of stuff requires your time and money. Stuff breaks. Houses require maintenance and property taxes. You think it's cheap to fix a yacht that accidentally clips a pier? How would it feel getting dings in your new Benz? Everything breaks. Everything wears out. Who likes to spend time and money on maintenance? Nobody does, except the people who earn their living doing that work. So be careful about what you own today because if you own too much stuff, you may get bogged down maintaining it. And if you spend too much time maintaining your stuff, you may not have enough time to earn something tomorrow...And most of us have to keep earning in order to maintain that stuff we already own. Don't worry, be happy because as much as we all want to get rich quick and be rich forever, doing so is not a soft bed of aromatic rose pedals. Everyone at every place in the socioeconomic ladder has challenges. At the end of the day, wealth goes back to what it has always been - what we leave behind with the people we touch. Always be earning for tomorrow and it won't matter what you own today, tomorrow or ever, because your wealth will be found in the hearts, minds and souls of those you touch. And remember that old saying, less is more. Less stuff can mean more happiness. Average annual unemployment rates in 2011 declined in 48 states and increased in 2 states and D.C. Eight states, including Nevada and California, and D.C. saw unemployment rates greater than 10% for the year. North Dakota had the smallest unemployment rate in the country for the year. The work force is expected to grow 7% annually through 2020, lower than the average annual 8% growth rate we saw last decade. The labor force will also continue to grow more ethnically and racially diverse. Hispanics, Asians and African Americans will each expand their share in the labor force, while white non-Hispanic's share will decline. The volunteer rate rose .05% from 2010 to 2011. 64.3 million people (or 26.8%) volunteered through or for an organization at least once during the year. The rate increased after declining the year before. To raise taxes or not to raise taxes, that is the question. Especially during an election year. 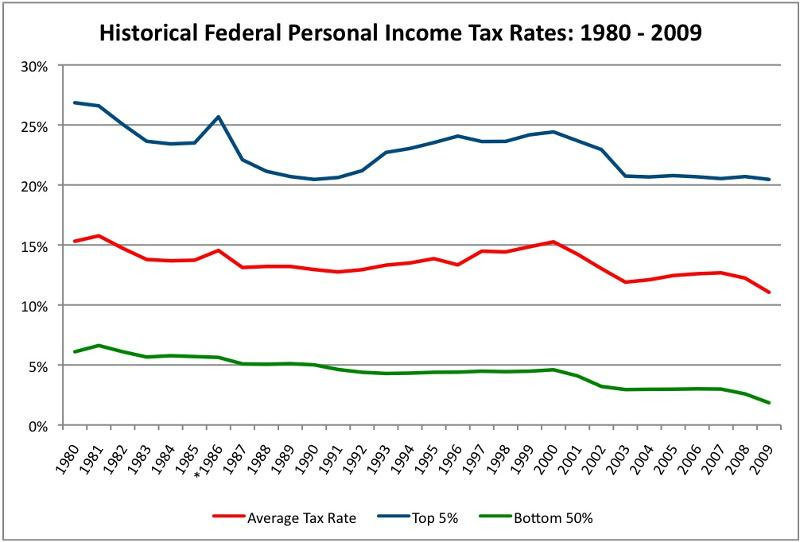 All the debate has gotten us wondering just where our personal income tax rate is historically. Given how often we hear complaints about tax rates, we were pretty stunned to see personal income tax rates have been declining across the board since 1980. Granted, most of us pay all sorts of other forms of taxes, and some of us pay none at all. But average personal income tax rates are the lowest they've been in 30 years. * Tax Reform Act of 1986 changed the definition of Adjusted Gross Income, so data before and after 1986 is not strictly comparable. The pursuit of happiness is so natural to Americans that it's actually strange to imagine a time where the norm was a pursuit of sullenness. While the cause remains debatable, historians generally agree that happiness as we know it today did not exist until about 250 years ago. All sorts of interesting things, positive and negative, have stemmed from happiness' debut, particularly in America, where we might rightfully deserve our international reputation as donning permanent smiles. With happiness came its opposite (unhappiness, something to be avoided), a cornerstone of our Constitution, garden cemeteries, laughing fits, unreasonable expectations of our spouses, a belief we are reunited with our loved ones when we die, the multimillion dollar self-help industry, Mickey Mouse, and on and on. Interestingly, happiness was often a function of economics, and then a tool of economics (in the 1940s, it was learned that associating products with happiness made sales soar). In this fascinating account, it's evident that happiness has literally spread throughout our culture, to near saturation in America. And it appears to be spreading globally too. The upside is that the pursuit of happiness does seem to create a higher number of happy people. The downside is how prone we are to frustration and depression when we cannot reach our high expectations for happiness. Another risk is a disavowal of normal sadness. Depression has found an accepted place in our culture. But what of just mundane sad phases, neither clinical nor long-term? What lessons might we be missing by denying a normal level of sadness we're all bound to encounter? What insights and improvements might we be denying? While the pursuit of happiness seems virtuous with many productive payoffs, we are still in pursuit of some sort of cultural balance where we recognize that sad phases have their productive value too. Keep an eye out for bad habits and broken thought patterns around these six areas that might be holding you back: Availability, Ignorance, Committees, Comfort, Momentum and Passivity. 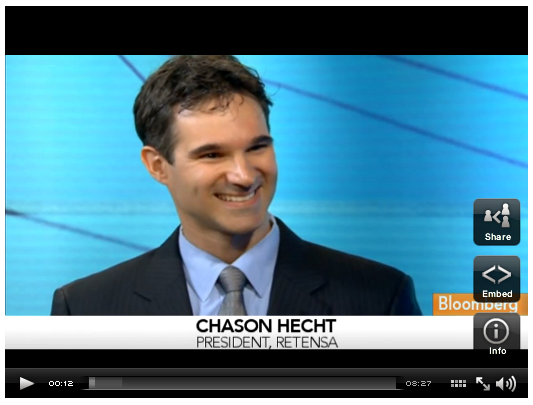 Happiness is key to employee retention, which is pretty obvious. It's also crucial to performance, which might be less obvious. Gallup found that employee disengagement costs $300+ billion a year in the U.S. Employee unhappiness is costly, financially and also in lost opportunities. Watch the following video for tips to ensure your employees' happiness, as well as how to be aware of the caveats of contentment. For his work, this author spent 300 days abroad last year. On his travels, he asked people from several countries, rich and poor, if they were happy. He saw something heartening, that people in poor countries often appeared happy. And he saw a trend, that those with greater access to technology were more likely to measure themselves against others and then feel less happy by comparison. He also points out that technology gives us access to an incredible amount of bad news and instantly. Mass media means more vigilance over our own personal happiness, which is helped by remembering that mankind has never been healthier, wealthier or fighting so few wars. A poll of 19,000 adults in 24 countries found 77% of respondents describing themselves as happy. While an inherent challenge to such a poll is that happiness and well-being mean different things to different cultures, the findings of by-country breakdowns countered conventional thought. 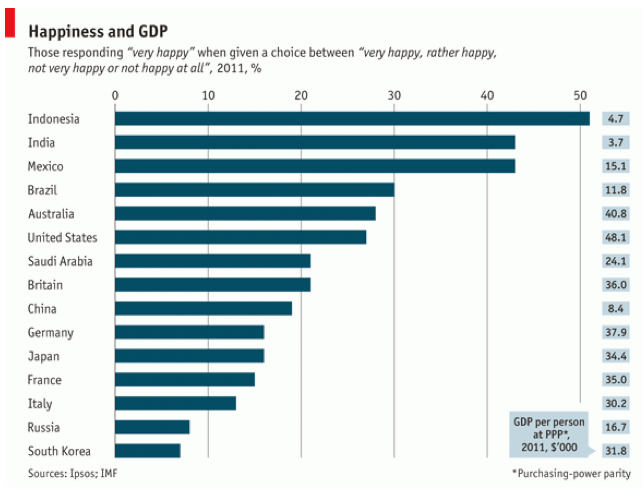 Emerging markets don't appear to share the present pessimism of the developed economies, and happiness appears to be highest in the poorer countries. The NYT released data recently showing how the number of Americans dependent on the government has risen sharply since 1930, doubling since 1969. Follow the link for charts and graphs depicting various data points from their research. 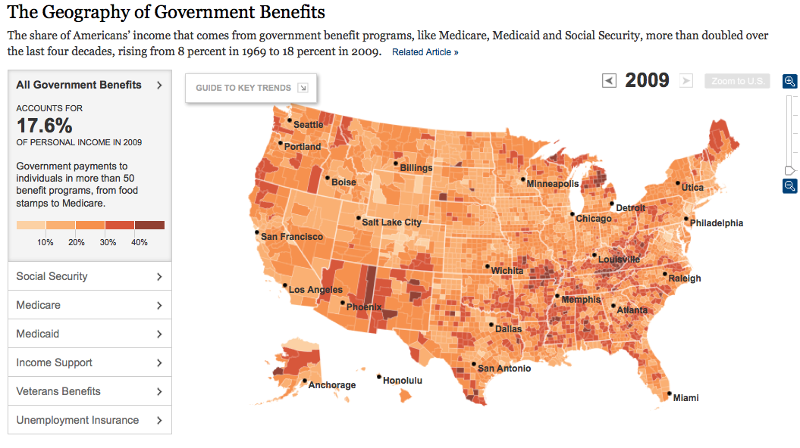 The Times also put together an interactive "Geography of Government Benefits," which shows how much county income goes to benefit and entitlement programs. Click the map to get to an interactive version. While economic numbers continue to be mixed, the news for the manufacturing sector is just plain good: It has recovered faster than the rest of the economy. For the second year in a row, private wholesalers of construction, mining, farm and industrial equipment saw sales increase an average of almost 15% in 2011. This growth could and hopefully will translate into job growth across multiple sectors. Some leaders sustain over ups and downs, others crack and flee. What's the difference between leaders on both sides? Sustained success comes down to what this author calls Superior Performance Intelligence, which refers to a three-pronged trait he's repeatedly seen in sustainable leaders, performers in military and athletes. The notion has three primary "know-hows": knowing how to maximize your potential; knowing how to work with your environment; knowing how to deliver top performance. As more companies become open to practices like flextime and telecommuting, those companies still adhering tightly to the 9-to-5 face time rule are perceived more and more as not trusting their employees. With trends shifting away from the old guard, companies might be wise to adapt to keep employees happy in a world where flextime is becoming a reasonable expectation. If trust is an issue, then hire people you can trust and treat them like adults. The freedom is motivating and makes for happier employees, and puts the focus on work quality, not work time. Despite confusing economic numbers, banks do appear to be looking to staff up some again. By analyzing current job postings from the 20 largest bank holding companies, Forbes determined that Citigroup is presently hiring the most, followed by JPMorgan and Capital One. Read on to find the types of roles these banks are looking to fill and where, as well as a full list of the top 10 hirers in banking right now.